A Lebanese-American journalist, a few months shy of her 90th birthday, nearing the end of a distinguished journalism career, makes a few irrational comments during a Jewish Heritage Week event at the White House. She was responding to a question from a young man who stuck a microphone in her face. The short interview was posted on the website of a rabbi, whose son was the cameraman. Thomas failed to follow the Number One You Tube Rule: Never give a flippant response to any questions from a stranger. Meanwhile, Israeli Naval commandos storm a Turkish relief boat traveling with supplies to Gaza. In the attack, the commandos kill a 19-year-old unarmed Turkish-American man, one of nine passengers who died in the attack. Which story provokes the greater outrage among American liberals? Which one is almost totally ignored? You have to ask? The unfortunate comment by 89-year-old Helen Thomas wins by a landslide. American Liberals, better known in some quarters as PEPs–Progressives Except for Palestine–demanded her immediate condemnation and total removal from polite society. In an earlier posting on Helen Thomas, I asked the question: Helen Thomas is Back and Obama Has Her: Now What Does He Do? 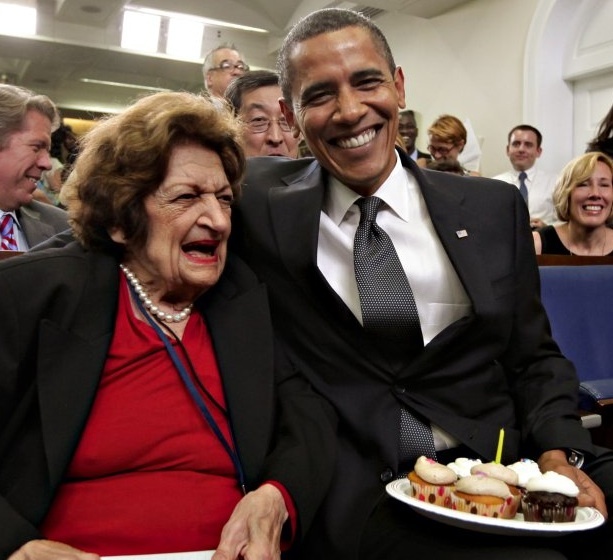 We have an answer: President Obama reacted to the inappropriate comments from Helen Thomas (Seen here together on Thomas’ 89th birthday) by joining the PEP chorus by calling for her retirement. And so it is that once again we have a Victory for the Israeli Hasbara. For more on Israel’s program which controls American public opinion from Tel Aviv, see my posting on the impact Hasbara has on American churches. One of the most striking trends following the flotilla attack has been how quickly Israeli hasbara has been exposed and discredited by internet journalists. Max Blumenthal’s reporting on the doctored IDF audio of the attack and Noam Sheizaf’s work on Turkish photos of the Mavi Marmara attack which contradict IDF claims. To these two I would add Lia Tarachansky and Blumenthal’s work disproving the IDF’s claim that the flotilla was linked to Al Qaeda, Jared Malsin’s work confirming the doctored audio, and Ali Abunimah, who has been in the lead on many of these stories and lately has been reconstructuing the path of the Mavi Marmara to show it was actually fleeing at the time of the Israeli attack. Instead of researching further these internet leads, the main stream media has fallen in line with the White House strategy of ignoring the Flotilla story, except when it dutifully reports that Obama sees the Gaza blockade as “unsustainable”, a typical Obama cautious observation about an ugly truth. 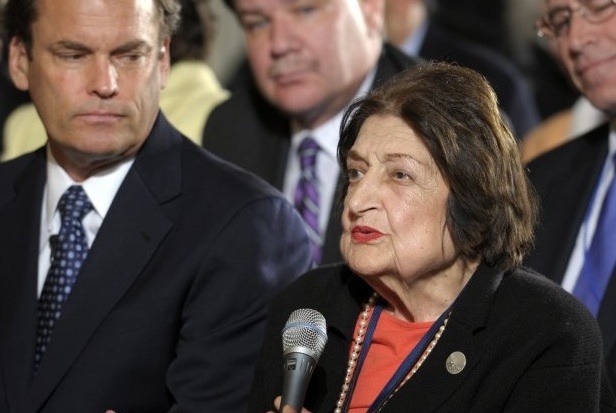 Fearless, decent seeker-of-truth Helen Thomas, 89, the preeminent challenger of political power for a half-century as dean of White House correspondents, has resigned her position with Hearts Newspapers. While speaking plainly on behalf of the rule of law in Occupied Palestine, her message was submerged when reporters gave it an anti-Semitic twist by quoting words out of context. . . .
Allison Weir, who left a successful career in main stream journalism to launch the valuable website, If Americans Only Knew, linked the Zionist smear of Thomas to the Flotilla story under the headline:As Israel kills and maims,outrage is directed at Helen Thomas. Currently, there are headlines about allegedly anti-Semitic comments made by senior White House correspondent Helen Thomas. Pundits across the land evince outrage at her off-the-cuff 25-second statement made to a man who appears to be holding a camera right in her face. According to eyewitness reports and forensic evidence, many of these aid volunteers were shot at close range, including a 19-year-old American citizen [Furkan Dogan], who was killed by four bullets to the head and one to the chest fired from 18 inches away. Israel immediately imprisoned eyewitnesses and hundreds of other aid participants, confiscated their cameras, laptops, and other possessions, and prevented them from speaking to the press for days. Among the incarcerated were decorated U.S. veterans and an 80-year-old former ambassador who had been deputy director of Reagan’s Cabinet Task Force on Terrorism [Edward Peck]. A 64-year-old piano tuner from California, Paul Larudee, described hundreds of Israeli commandos boarding his ship. When he refused to cooperate with them, soldiers beat him numerous times both on board the ship and after he was imprisoned on land. Jonathan Cook points to Lanny Davis, counsel to the White House in the Clinton administration, and now a Washington lobbyist, as a prime example of a US liberal who is guilty of nothing less than “moral failure” in his attack on Helen Thomas. Cook’s piece appeared in The Electronic Intifada. It is that widely-accepted analogy, appropriating the black and Native American experience in a wholly misguided way, that reveals in stark fashion the moral failure of American liberals. In their blindness to the current relations of power in the US, most critics of Thomas contribute to the very intolerance they claim to be challenging. . . . Unlike most Americans, who were half-wakened from their six-decade Middle East slumber by the killing of at least nine Turkish activists, Thomas has been troubled by the Palestinians’ plight for much of her long lifetime. She was in her late twenties when Israel ethnically cleansed three-quarters of a million Palestinians from most of Palestine, a move endorsed by the fledgling United Nations. She was in her mid-forties when Israel took over the rest of Palestine and parts of Egypt and Syria in a war that dealt a crushing blow to Arab identity and pride and made Israel a favored ally of the US. In her later years she has witnessed Israel’s repeated destruction of Lebanon, her parents’ homeland, and the slow confinement and erasure of the neighboring Palestinian people. Both have occurred under a duplicitous American “peace process” while Washington has poured hundreds of billions of dollars into Israel’s coffers. It is therefore entirely understandable if, despite her own personal success, she feels a simmering anger not only at what has taken place throughout her lifetime in the Middle East but also at the silencing of all debate about it in the US by the Washington elites she counted as friends and colleagues. . . . The picture at the top of Helen Thomas questioning President Obama from her front seat (while three white guys look sternly on) is an Associated Press photo by Susan Walsh. The birthday picture is an Associated Press photo by Scott Applewhite. This entry was posted in Media, Middle East. Bookmark the permalink. please send me Helen Thomas’s e-mail or US Mail address so I can send her my commendation and support. As an advocate of Palestinian rights and a long-time critic of Israeli policy toward the Palestinians, I find it extremely distressing to see rationalizations made for the statements by Helen Thomas. I have admired Thomas’s tenacity and willingness to confront various Presidential administrations over the years. However, her statements about the Jews getting the hell out of Palestine and going back to Germany and Poland and America were unacceptable. When we are not willing to criticize unacceptable statements by people with whom we normally agree, we lose our moral voice and come across as hypocrites. Thomas’s statements did not criticize Israeli policy or actions of the Israeli government. Instead she focused on “the Jews.” Saying that the Jews should go back to Germany and Poland is absurd and bizarre on a variety of levels. The Jews did not leave Germany and Poland by choice, but as a result of a horrific genocide. Even following World War II, members of the world community did not open their borders to the survivors of the Holocaust in response to what happened. If the world community had responded differently, we might not have been dealing with the consequences in terms of the Israeli-Palestinian conflict. Hi, nice post! I really like your post about Helen Thomas. That is so bad for her. They just do not want to leave her alone, do they? Ms. Straus: Ms. Thomas’s statement expressed her righteous wish that Jews–brought from Europe and America to Palestine, enticed by free gifts of land and automatic citizenship while displacing Palestinians, settling on their land and in their very homes, should stay in their countries of origin, and not be part of an illegal apartheid state . But her statement has been twisted even misquoted in order to silence the only voice of conscience in the Washington press core. You must know better. This is not an racist statement at all, but her reaction to a huge injustice. Where is your rage over the atrocities Israel commits daily? It is too bad Helen Thomas did not choose a more thought out reply. One cannot blame her simmering anger, but I think she might have said something more enigmatic. I believe the situation of accepting Israel’s throwing out people from their homes without compensation, and continuing to harass them, is the greatest crime committed by the U.S., which has had every opportunity to put Israel in its place. It is the fact that Israel is helping the U.S. establish its own hegemony of the Middle East.